'Woodbury House', the James Watson Webb estate designed by Cross & Cross c. 1915 in Woodbury. Click HERE and HERE for more on 'Woodbury House'. Photos courtesy of Old Grey Dog. Click HERE to see the estate before the area was developed in a 1953 aerial shot. This house raises that age old question about the importance of the client in the design. Only three years separate this stiff, even awkward, house from the same firm's masterful 'Bayberryland' for Charles Sabin, and what a world of difference---and what a world of contrast with the Webb's later house in Westbury---or their 'Brick House' at Shelburne. And in these marvelous and evocative photographs, perhaps the most startling of all is the infinite amoutn of open land---less than 100 years ago. Beautiful pastoral scenes of an often overlooked and mostly forgotten mansion and of Long Island's open rolling landscape. The building has some wonderful brickwork, stone details, nice proportions and some very comfortable interior spaces. The Syosset-Woodbury Park, part of the Town of Oyster Bay Parks system should be thoroughly taken to task for mistreating and neglecting this house for decades to the point that most residents visiting the park presume it is abandoned and derelict. While the town has lavished money on the town golf course just north of Woodbury House, it seems to manage only a few bucks a year to maintain this decaying property. Under the towns current system of care this building's future is doubtful, especially after large sums of money were spent on building new facilities within the park, leaving little options for public use for this structure. I was lead to believe that the manor house at Shelburne Farm was converted from shingle-style to brick due to the severe impact of Vermont winters making brick more practical. After seeing Woodbury House you have to wonder if JWW wasn't more smitten with brick and did the alteration more for his own aesthetic reasons. Was this home still in the family possession, along with the Park Ave residence and the Shelburne Farms operation when Webb died in 1960? If so then one can see why their one time hefty fortune was put into significant peril. Shelburne House dates from 1888 and shortly thereafter it began to acquire additions so, by the early 1890s it more than doubled in size ~ still in the shingle style. In the mid 1890s the service and guest wings were further enlarged and built of brick construction and the older sections received a veneer of brick to match. By 1899 the house reached its greatest size with a further addition to the great west wing. Eldest son, J. Watson Webb, never owned Shelburne House, nor Shelburne Farms, but was deeded the southern 1000 acres in 1913. 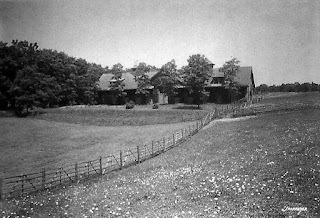 This became known as Southern Acres Farm and was where he remodeled, and enlarged, an existing building calling it The Brick House. Hilltop estate in Stamford/Greenwich, Connecticut ~ in actual materials it resembled Shelburne House. The Webbs disposed of Woodbury House when they developed a colonial-style estate in Westbury in the early 1920s ~ which was always called "the Westbury house". Kellsboro, wrong Webbs. Watson's parents owned and remodeled Shelburne. Watson & Electra Webb had a house known as 'Brick House' on another portion of the estate. They gave this house up for the house in Westbury that I already referenced. Oops, great minds---even as I was composing my reply above, interrupted by a phone call, OGD was framing and posting his own response---better and more thorough. BTW, I've always assumed/understood, that the brick veneer on Shelburne, which took much of the life out of the design, was the end result of enlargement and greater formality than any particular weather consideration? Yep - I picked up on the Webb ran off like a foaming at the mouth dog. My apologizes for the mix-up. Oh so reminiscent of the families home at Shelburne Farm alls missing is the lake view. Beautiful but sad in todays state. Thnx Grey Dog for two days of images that uniquely capture some glorious homes and landscapes. Anyone been inside woodbury house?